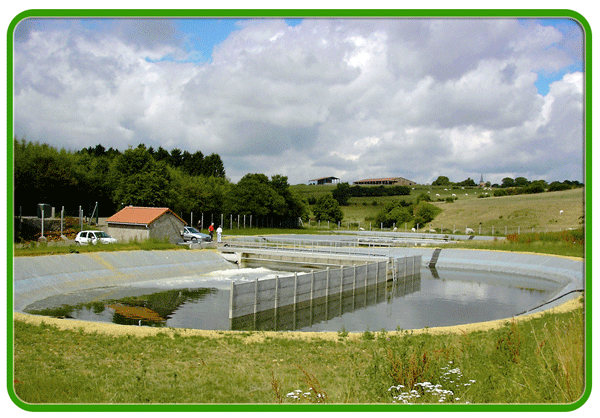 BioGyr® is a rustic, extensive and highly capable wastewater treatment plant, based on the principle of an aerated lagoon by air blowing. Bounds to domestic wastewater treatment for a natural disposal, BioGyr® is particularly suited to small communities from 500 to 50 000 inhabitants. It has many economic, environmental and operationnal advantages. 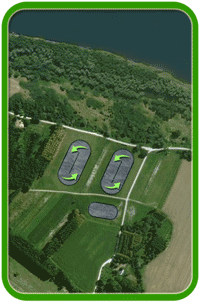 The main interest of BioGyr® is its low operating cost: up to four times lower than a traditional solution of aerated lagoon. With a footprint of 2.5 m² per Population Equivalent, this process is both compact and easily extensible. The worsening pollution is possible by the formation of a purifying biomass at the tank’s bottom. This technique, one of the oldest methods of wastewater treatment, has the advantage of being simple and reliable. The risks of failure are very low given the absence of electro-mechanical equipment immersed in the tank. BioGyr® is an extensive process able to absorb strong variations of debit or pollution. Its quality of treatment is constant given the high volume contained in the tanks. This process withstands very well hard conditions such as very low temperatures. Half-hour a week is enough to maintain a BioGyr® unit: it consists of a simple visual inspection and does not require special expertise in water purification. In normal operation, no further human intervention is particularly needed: the first sludge management appears only after five to ten years of operation. Due to the rustic character of the process and the significant aeration, there is no odor even during overload pollution. By creating a permanent movement of the surface and the regular passage of all water to a depth of 3 meters, the survival of mosquito larvae is inhibited, making the process naturaly insecticide. For more information about BioGyr®, please contact us.